John Love, Jr., and his father John Love started construction in the late 20's, I think it says 1925 on the chimney. 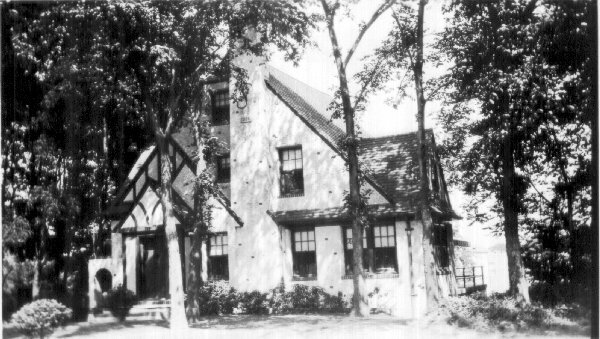 They lived there from 1933 to 1935, when they lost the house during the depression years, they then moved to 62 Gaston St. in West Orange. John Love, Sr earned $5 a week in those days playing with the Barnyard Boys on the radio and that was not enough to eat and pay the mortgage. One day he backed out the driveway in one of Uncle Al's coal delivery trucks and backed into the telephone pole across the street and the entire light fixture fell into the truck with a crash and he quickly drove away with the light in the back of the truck. Eunice (Ross) Love, wife of John Love, Jr, used to walk her son Roger down the hill to Orange Park which was one block down the hill.